In our running around operating, we basically totally forgot to take pictures this time, so unfortunately I have none to share. Chris KG6CIH and I headed out on the road again in the ARRL September VHF+ Contest. We managed to activate 6 grids - FN33, FN32, FN43, FN42, FN41 and a drive through of FN31. We once again got going a little late, but it wasn't too bad. We made it to our first stop on Equinox Mountain in FN33 and get enough together to operate by around 2:45, 45 minutes after the contest start. This is of course where things started getting messy. Our 6m moxon was showing infinite SWR across the band. I got Chris going on the other bands by tossing my mic for 2m at him and ran out to look at the antenna. I had thought that I had made the connector pretty solid this time around, but much like last year there was a cold solder joint on the ground. I managed to kludge this together with some random wire and duct tape, and the antenna was back on the air. Since nothing can start out well, I had a heck of a time getting going on 70cm. I received a "new to me" Yaesu FT790RII a few days prior to the contest, and only had time to test to ensure it worked on a very basic level. I had replaced the stock bullet connectors with power poles, which promptly fell off (must have crimped them poorly) when I plugged them in right before operating. These radios also only display the last digit of the MHz. I had no idea if I was on 432.100 or 442.100. Luckily, I brought more bits for power poles, and was able to get the radio powered. It wasn't until we got into the next grid that I was able to confirm that I was on 432MHz (used an HT to confirm) and so we were without 70cm at all on Equinox. I also am starting to doubt that site for roving. It was dead up there, which is very bizarre. Last year we had some good luck, I worked down into near Harrisburg on 2m. This year we could barely get more than maybe 2 grids away in any direction. I don't know what was going on. We aren't on the summit, but down 100' or so. Even still, we had a great view to the South, West and East. There really isn't much taller than us for hundreds of miles. I suspect the big problem is WB1GQR. For years, he's been setting up on the summit (which is the reason we're not on the summit). I'm pretty sure he's running decent power, and his signal is very wide across the band. Anyone trying to work us is going to get clobbered by him. It's his spot, he's got long prior precedence, so we need to start looking for another great place to start out the weekend. Interestingly, I had at least one report of him causing issues with our signal in the next site as well. We got down off of Equinox at the last possible moment, we were just starting to drive away when the sweep truck came by to kick us out or lock us in. We made a quick stop for dinner (at the fine dining establishment known as Taco Bell) and carried on to Hogback Mountain in FN32. There is a nice parking lot here that is off the road, with space to set up and be out of everyone's way. This was somewhat productive, but it still seemed that there were still significantly fewer signals out there. We again were unable to work anywhere beyond the nearby grids. I'm not sure if this was the same everywhere, but it was very hard to find any stations to talk to, whether running or S&P. An issue we had on both Equinox and Hogback was cell service. I had the numbers for a handful of stations, but had no service on Equinox and only occasionally had enough service on Hogback to get a text out. I had a lot of difficulty trying to contact anyone to drum up contacts. Around 10:30pm local we called it for the night, QSOs were drying up and it was getting frustrating. We hit up a hotel, and slept until the neighbors woke us around 7am by being...friendly...with each other. Since we were up earlier than planned anyway, we grabbed breakfast and headed for FN43. Sunday started off better than Saturday was. I'm not sure if this stop was worth it, but it tagged another grid for us. We swung up into Bow, NH and worked a couple of stations. We got bit here by a bit of disorganization. 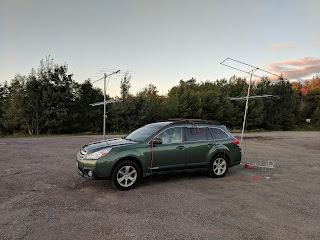 We had attempted to get the moxon off the rover to run 6m, but it was blocked by the mast with the mobile loops. After getting annoyed, we just worked 2, 70 and 1.25. I was able to call up AF1T and we ran the bands with him, and we worked W2SZ on all three as well. We didn't spend much time here, but will have to keep it in mind for next year. The hill we were on was a great little spot for operating with loops, though maybe a little close to the road to get the beams going. We left FN43 and headed for Boxboro. The plan was to hit up the parking lot at the ARRL convention taking place. This worked reasonably well. I was able to work a handful of ops on HTs, as well as mobile ops leaving the convention. Our timing was a little off, a lot of people had left already. We also suffered another equipment failure here, the clip that held our 222MHz beam onto the mast broke. We got up on 2m and 6m sideband, but had no 222 and with 70cm we only had an HT. This wasn't meant to be a long stop, and we did dig out another new grid (FN44 on 6) so it wasn't awful. Had we arrived 45 minutes earlier, we may have been in really good shape. The 2m beam was low here, and so sideband contacts on that band was rough. Not wanting to end the contest without another good activation, we continued on to an old AT&T microwave site in FN41. This was a nice location, plenty of room to set up. The towers were still in use, so we had a fairly large amount of hash from that. Without the noise blanker enabled on my IC746, 2m was a mess, but fortunately I could filter most of it out. We ran the bands with quite a few stations here, even making it up to AF1T in FN43 despite the path being directly through the tower in front of us. We worked quite a few FN31 stations here, they all came out of the woodwork at the same time. Oddly, we never even heard K1TEO in any location. We had aimed the beams at him a few times, but must have had something in between each time. As we had familial obligations in the early evening, we packed up from FN41 and headed out to activate FN31 on the road. As we passed through the NE corner of the grid, we worked W2SZ on 2m sideband for our 6th grid, and headed home. A few things worked really well this time around. We didn't want to leave the station batteries connected to the car battery during operation, to avoid being stranded and having to make a call to AAA. Last year, this involved climbing into the back of the car and disconnecting 200Ah of deep cycle batteries from the car battery and alternator, which was likely sufficient juice to do some gnarly damage had I touched the wrong things at the wrong time. We had to do this each time we started and stopped, which also soaked up a lot of time. This year, I attached Anderson SB-120 connectors to the leads from the car to the station batteries and connecting and reconnecting became an afterthought, literally seconds each time. The mobile mast, with 2m, 1.25m and 70cm loops paid off as well, though with a caveat. We were able to activate 2 grids (FN43 and FN31) that would have been impossible in our allowed time with the normal setup. When combined with the 2m FM transceiver and mobile antenna on the car, we had pretty good luck on the road. The main issue was that we had to remove this mast each time we stopped, so that we could put the 6m and 1.25m mast up. This cost us more time on setup and tear down. Not a whole lot, but could have been better. We also should have had a 6m loop, but the one I built wouldn't load up anywhere near 6m. I need to fix that. The antenna was also probably too heavy for the PVC mobile mast, so I need to find a source for a lighterweight 6m loop for January. I'll fix the copper pipe one I made and use it at home. Chris' station was set up in a milk crate, which made it pretty easy to get on the air. I just had 2 loose radios, which took me a bit more time. I'll have something similar for next time. Having a dedicated transceiver for each band we were working was amazing. We had a bit of a rough start with 70cm, but once I got the 790 figured out it worked quite well. In the future, I'll try and have my radios figured out before we get on sight. There just wasn't a whole lot of time between it arriving and gameday. We only worked 2 and 70 while mobile, but it was productive. The backup and mobile 2m station was my FT290RII, and between this, the 790 and the FT2900R for 2m FM we had a decent number of contacts on the road. They were just balanced on the armrest and on the seat behind us, which was less than ideal. Next time, we'll have a dedicated radio for 70cm FM. Next time, we need to figure out power routing and coax routing. There was a lot of mess moving cables between mobile operation and fixed operation. This was the first time we had a run-and-gun station in the rover, so it was a learning experience. Having phone numbers for a bunch of other stations worked out, though we only really managed to contact Dale AF1T. I think it may have been because I called him, rather than texting like I did with the other stations. It was too hard to manage asynchronous communication while trying to also make contacts. A big thanks to Dale, every time I called he was ready and willing to work. He almost always had another station on the air, but on several occasions asked them to hold while he ran the bands with us. All in all, most of our plans worked out pretty well. We need a new place to start the contest, and just some more cleanup and organization in the rover. Our claimed score is 6364, with 172 points (137 QSOs) and 37 mults. The score is down a bit from last year, but we managed to mitigate the damage some by a higher Q count. We've already started planning for January and next September. The cycle continues.